Turn 10 is back at it again with their sixth installment of Forza Motorsport 6 and this is truly something special. Turn 10 has been responsible and behind the wheel of delivering to us some of the best racing simulations on the market today exclusively for the Xbox now for 10 years. Truly an accomplishment! Out of the box Forza Motorsport 6 (FM6) really sets the tone for the rest of your experience with this title. The opening sequence introduces the concept of racing and poses a question as to why we race with an immediate race at the hills of Copacabana beach where you are introduced to the 2017 Ford GT and immersed into your first race and is it truly beautiful. The harmonics of the twin-turbocharged 3.5-liter EcoBoost V-6 engine is true music to your ears . The graphics that Turn 10 brings to FM6 is truly remarkable. With the newly introduced rain effects to the Forza Motorsport series (first introduced in Forza Horizon), they have really refined the look and feel of what its like to be on a wet track making it a quite an intense experience as you hold of for you life hoping to not lose traction as you enter the apex. The windshield wipers queue up and increase in speed as the rain gets more intense. It is truly an art to experience something like this on a console platform witnessing the rain droplets bead up past the windshield turning in to waves of water spraying behind your vehicle as you pass other racers on the course. Another added element this installment is night racing. No two cars feel the same driving through the various tracks offered in FM6. Driving in an early 80’s E30 Chassis BMW E30 M3 you make your way around the faint pitch dark track seeing corners seconds before the turn in the mere split second as you approach until you see another opponent in front of you. Queue in a 2015 McLaren P1 hypercar, you see the LED taillights almost blind you momentarily from the pitch black environment around you is truly breathtaking as you slam on your brakes taking control of the black asphalt. FM6 unlike any other title in the series to date. In this installment FM6 offers over 460 plus playable vehicles in the game (this time all examinable. In, out and even the engine bay through the ForzaVista mode). From your favorite manufacturers from the 80’s to the 90’s, to Indy cars, all the way to all the hyper cars you’ve seen only on television, which you have been dreaming about, are all at your fingertips. With more selection comes a new in game selection menu as well which is an evolution of something that was introduced in the Forza Horizon series and was refined making the in game experience much more organized, from races, cars, tuning settings, and of course a menu dedicated to customization. Another added element to the gameplay beyond the standard races seen in the main career mode is the Showcase races. Through this mode special cars and racing series are introduced to the player where they will get to partake in Indy car races, endurance races (brought back from FM4), as well as my favorite, Autocross racing (which was taken out from earlier installments of the Forza Motorsport series games) just to name a few. The newest concept introduced to the game is the use of Mod packs. Mod packs are rewarded to the player for the completion of a race series which is an experience system used throughout FM6. Here you will have the ability through drawn cards to add payout bonuses, car handicap, race placement and handling advantages in the single payer portion of the game. Although it was a neat concept to begin with I found myself using it less and less as I progressed throughout the game and sometimes even forgetting about it. Forza Motorsport 6 has really evolved into a masterpiece title. It will be a treat for any person who loves cars from the die hard gear head all the way to someone who just loves a pick up and race game. So many key visual and game play features offered in this latest installment make this by far the best Forza Motorsport title yet from driving through the beautiful heavy rain in the slickest conditions, to the night racing with so much anticipation looking for the next upcoming turn. Turn 10 has created hands down one of the best race console driving simulators available on console today offering a true racing simulation of many mediums with a vast customizability layer for players of all types. 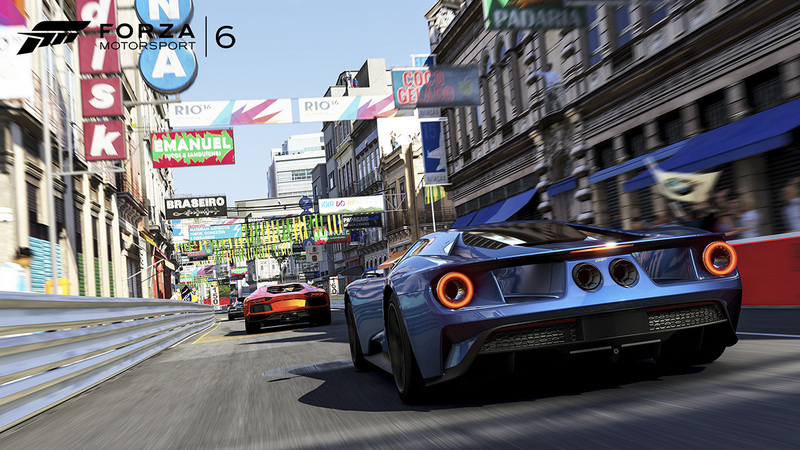 Forza Motorsport 6 is now available exclusively for Xbox One.